‘Stumbling On Happiness’ is an experimental psychology-based examination of the limitations of every human’s ability to make themselves happy. Written by Harvard psychologist Dan Gilbert, it uses mainly psychological experiments to explore these limits. The author’s main thesis is that while humans are unique in their ability to predict their own futures (compared with other animals), they are not in fact, very good at it. This poses a considerable problem for their ability to take actions which will make themselves happy. In addition to this problem, humans are also poor at predicting what future states or situations will actually make them happy. Stumbling On Happiness contains an immense amount of material taken from experimental psychology, neurophysiology, neuropsychology, evolutionary biology, and some philosophy. The author explains, in a fun and readable way, current difficulties scientists have in determining how happy someone is (how happiness can be measured, in other words), what kind of scale can be used for happiness and how comparable one person’s scale is to another’s. Experiments are reviewed which reveal that people are actually significantly limited in recalling how happy they were in past times, and so they cannot accurately use this information to plan the future. Other experiments demonstrate that many subtle influences (such as the weather, for example) may influence a person’s recollection of past events and how happy that person thought he was - independent of the actual event. All of this leads to great difficulty in people’s ability to make themselves happy. (1) Experiment Interpretation: This book is chock full of results from the fields of experimental psychology and neurophysiology. Unfortunately, the experiments often lend themselves to alternative interpretations which the author does not seem to consider. Indeed, and surprisingly, the author’s interpretation is nearly always in the direction that humans simply cannot predict what will make them happy, cannot remember information correctly, or cannot perceive well! The experiments reviewed often demonstrate ‘flaws’ in people’s perceptual abilities or interpretations or predictions in extremely artificial, unique, or limited circumstances. The author, surprisingly, then goes on say that all of human experience is riddled with these same mistakes. This tendency to overgeneralize likely stems from the author’s philosophical influences (see the next point). (2) Negative philosophical influence: The author is clearly influenced by, and quotes, Immanual Kant’s ‘Critique of Pure Reason’. Kant’s philosophical ‘gift’ to philosophy was to systematically undercut the validity of the faculties of human perception and reason. Gilbert clearly wishes to accomplish this same sort of feat in the field of happiness. I think this overarching desire advises his selection of what experiments to include and colors his interpretation of them. (3) Catalogues human errors: The author also demonstrates many errors the average person might make - and usually concludes that people are doomed to continue making these errors, or that these errors are fundamental to all humans, and cannot generally be avoided even once people are made aware of them. This also seems unwarranted. There is no reason people cannot learn to avoid making many logical errors once they are made aware of them. 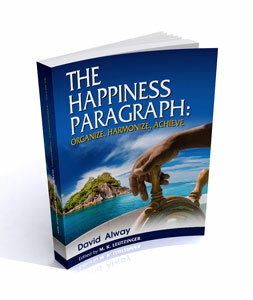 (4) Offers a constricted view of happiness: Happiness, to me, is a general assessment of how your entire life is going - including your past, what you think of yourself, and where you think you are headed (see my eBook - The Happiness Paragraph). Gilbert’s conception of happiness is much more limited - describing more of what I would call short-term ‘joy’. Because the author tends to study only this more ephemeral emotion, he misses the more lasting, meaningful, and predictable contributions to long-term happiness. As an analogy, imagine the author was watching a group of people preparing for a great ocean voyage in which they hoped to find gold (happiness) in a distant land. It is certainly the case that there may be problems along the way. Navigation may not be precise and many mistakes can be and often are made. You may not enjoy the trip as much as you imagined and you may not reach your destination, or having reached it, you may find there is no gold to be had. Or maybe you find gold, but learn later that another destination would have been even better for you, with even more gold. All of this is true, but on the other hand, many people do in fact succeed in getting the gold: they plan it and they achieve it. In addition, those who just sit on shore achieve worse than nothing - as their opportunity for happiness is lost. One very helpful idea the author explores and promulgates is the concept of relative happiness. He points out, properly, that happiness seems to be a relative thing. A person must compare his happiness now to his happiness at other times, or to other potential circumstances that would make him happy. Also, one value makes you more or less happy, compared to another value. There is no absolute scale but only a relative scale that you keep track of mentally. In addition, it is difficult (or perhaps impossible) to compare one person’s happiness to another’s. Despite its positive aspects, 'Stumbling On Happiness' represents a fundamental attack on people’s ability to design a life that will make them happy. While the book is interesting, I believe it is also flawed due to the problems already mentioned. Most especially, because the author overgeneralizes from minutia and focuses on short-term ‘joy’ (instead of happiness), he misses the bigger picture and perspective on happiness. The author never discusses those general principles required to achieve happiness (expending effort, the happiness-producing properties of achievement, the backward looking evaluation of your life and accomplishments, the elimination of fundamental value conflicts). These general principles help us to make worthwhile and ‘happiness-producing’ decisions, even if we don’t make every decision perfectly. I recommend reading ‘Stumbling On Happiness’ by Dan Gilbert not because I agree with his major conclusions, but because it is an interesting exploration of aspects of the human mind as it relates to happiness. I do not recommend this book for those looking for insights on how to be happier.